People actually liked it so much that the brand extended the initial week-long activation to three weeks. Does the thought of burritos, pizza, and fries made out of Pop-Tarts whet your appetite? That’s what was on the menu at Pop-Tarts’ limited-time takeover of Kellogg’s NYC restaurant in Times Square. The Pop-Tarts pop-up was so popular with fans that the brand extended the initial week-long activation to three weeks. Planning for the campaign began in fall of 2016. With help from Krispr, Edelman’s Chicago-based comms marketing arm, Pop-Tarts devised the creation of a pop-up shop in New York City that would help the brand engage with fans. "We identified Kellogg’s NYC space as a great opportunity and plans evolved into highlighting the Pop-Tarts portfolio," said Brandy Ruff, director of brand PR at Kellogg's. The Kellogg's NYC space opened in the summer of 2016, generating great buzz with a menu designed by Momofuku Milk Bar owner and founder Christina Tosi. Pop-Tarts became the first brand to "take-over" the space and the campaign team wanted to create a unique concept which would generate both consumer and media interest. "Our goal was to surprise fans and media, and encourage them to think about Pop-Tarts differently – whether that was as simple as trying one of the 18 flavors they may not have known about, or taking a chance on a re-imagined burrito or plate of nachos," explained Ruff. The Pop-Tarts party continues! We're extending #PopTartsCafe for two more weeks! Here is our Pop-Tarts ? ?with Brown Sugar Cinnamon Pop-Tarts, strawberry sauce, frosting, fruit leather pepperoni, and fresh mint. In terms of a social strategy, the brand also looked to partner with several organizations which would help drive young adults to experience the café activation. Kellogg’s NYC closed on February 20 and opened as Pop-Tarts Café on February 21. The space was decorated with colorful chalkboards and graphics highlighting Pop-Tarts’ frosting, sprinkles, and filling. Kellogg's experiential partner, Co.Create, helped develop a menu of sweet twists on savory dishes, mash-ups, loaded milkshakes, and traditional tarts. A grand opening breakfast invited target media outlets in to experience the café and share live social coverage of the menu items, as well as conduct interviews with Pop-Tarts’ marketing director Angela Gusse, along with Sandra Di Capua and Anthony Rudolf, founders of Co.Create and partners with Kellogg's NYC. USA Today was given exclusive access on the day of launch and captured footage of the menu items and recipes. Pop-Tarts also partnered with food and lifestyle site Spoon University to reach fans on social. The outlet captured and shared behind-the-scenes footage of the menu items. Ambassadors from the outlet broadcast live on Snapchat from the café throughout the first week of the activation. 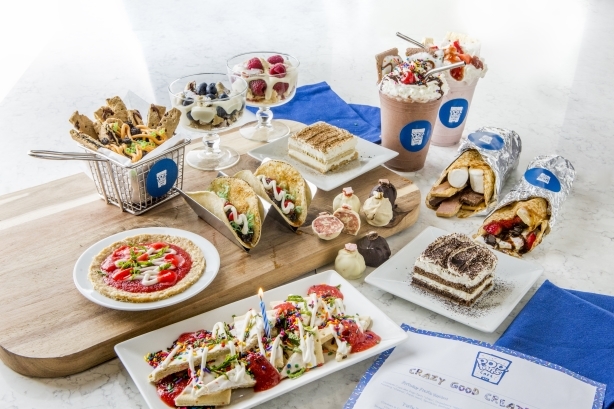 "To extend the pop-up beyond the Pop-Tarts Café doors, we partnered with UberEats for a one-night promotion allowing free purchase and delivery of one of the most popular items on the menu – the Pop-Tarts S’Mores Burrito," added Ruff. Through the UberEats partnership, on February 24, people within campus limits of six New York schools – New York University, Columbia University, St. Johns University, Hofstra University, CUNY Brooklyn, and Fordham University - could order a burrito to be delivered to their door. The campaign efforts generated more than 2.1 billion media impressions, measured across both social and traditional outlets. The Pop-Tarts Café drew in crowds of between 1,000 and 1,500 visitors per day during its first week and continued to pull large crowds throughout the remainder of the activation. USA Today broke the story early on launch day, both in print and online, with news of the café being included in its daily "5 things you need to know" roundup segment. This Is Insider, BuzzFeed News, and BuzzFeed Bring Me also visited Pop-Tarts Café to capture footage of the menu items and the overall experience. In addition, CBS This Morning visited to share an Instagram story and Forbes broadcasted a Snapchat story of the café. The activation generated feature stories in notable outlets, including: Bloomberg, Forbes, Mashable, Cosmopolitan, Uproxx, Glamour, and Time Out New York, to name a few.